Browse:Home Wilnoteka Valdas Benkunskas: Schools in Vilnius should be rearranged now, not in two years’ time. Valdas Benkunskas: Schools in Vilnius should be rearranged now, not in two years’ time. Although the Seimas of the Republic of Lithuania delayed the education reform for two years, central authorities intend to reorganize all schools before the 1st September 2015. Valdas Benkunskas, who is the Vice mayor of Vilnius and a conservatist, stated that ‘the Law on Education is non-binding’. ‘Our aim is to conduct the reform in a responsible way, as it was anticipated in the coalition agreement. 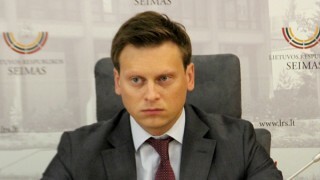 That is why the lack of self-identification in the Seimas and Ministry seems unreliable, when the game rules are changed in the last moment and when everything had to be finished a long time ago.’ – explains Valdas Benkunskas, who is the Vice Mayor of Vilnius and is in charge of the education in the capital city. In his opinion, certain ‘lobby groups’ that want to uphold the current situation contributed to the delay of the implementation of the reform. On 30th June, during the last meeting in the spring session, the parliament accepted the amendment to the Law on Education, by virtue of which the final date of implementing the new education system is postponed by two years, i.e. till the 1st September 2017. ‘The Law on Education is non-binding for us and we can bring the reform to the end before September. There are a lot of emotional reasons: that schools are unprepared, that they weren’t informed, that the communities were not familiarized (with the reform proceedings – editor’s note). Basing on these arguments, they ask for still one year of activity on the previous rules. Now, the assessment of each individual school is ongoing: if there is any point or there is not; what is the situation with students in other schools; if they wouldn’t be closed if external students do not come. I think that before the 15th July, which is before the Union Council meeting, we will have the answer – said Valdas Benkunskas. The Vice mayor of Vilnius ensured that the schools whose aim is to acquire the status of junior high school are evaluated by the same rules, no matter whether it is a school with Lithuanian or Polish language teaching. Valdas Benkunskas claimed that the three so called ‘prolonged junior high schools’ (secondary education schools) can be formed: Mikalojaus Daukšos, Tuskulėnų and Abraomo Kulviečio schools. These are institutions with Lithuanian language learning. Schools with Polish and Russian language learning (10 institutions) also apply for the status of ‘prolonged junior high schools’. The status of four Polish schools is still uncertain: J. Lelewel, Wł. Syrokomla, Sz. Konarski and Lazdynai High Schools.